Bio Notes: William Richard Lethaby was born at Barnstaple on 18 January 1857, the son of a radical nonconformist carver and gilder, Richard Pyle Lethaby. He was educated at Barnstaple Grammar School and at the local Literary and Scientific Society. In 1871 he was articled to the Wesleyan architect Alexander Lauder and remained there until 1878 when he joined the office of Richard Waite at Duffield, Derbyshire followed by an office in Leicester. In 1879 Lethaby won the Soane Medallion and Travelling Scholarship and travelled in France. His drawings were published in the Building News and attracted the attention of Richard Norman Shaw who engaged him as his chief assistant to his return to London. He entered the Royal Academy Schools in 1880 winning the Silver Medal, a was co-founder of the St George's Art Society which became the Art Workers' Guild. In 1889 Lethaby left Shaw to commence practice on his own account at 10 Hart Street and with Reginald Blomfield, Mervyn E Macartney, Ernest Gimson and Sydney Barnsley founded the furniture-making firm of Kenton & Co. 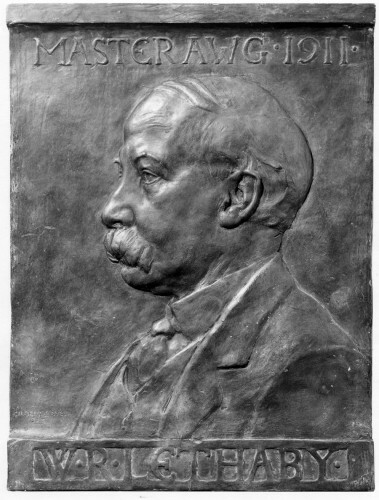 Thereafter he became first art adviser to the Technical Education Board of LCC in 1892 and one of the founders of the Central School of Arts and Crafts where he taught architecture with Halsey Richards and was principal 1902-1911; and in 1900 he became first Professor of the Royal College of Art a post he retained until 1918. These commitments, together with a mishap in the practice induced him to retire from architectural practice in 1902. Lethaby declined the Gold Medal in 1924 and died in London on 17 July 1931.